This classic song has been featured in film and media for decades and is beloved by people of all ages who have varying music tastes. It’s an emotional, beautiful song with vocals that leave you breathless – or have you singing along. Covers of classic hits are nothing new, but it’s always interesting when a band of an entirely different genre covers a song that initially sounded different from their work. The results can genuinely be mesmerizing. That’s precisely what they were when this Simon and Garfunkel song was covered by an American alternative band called Disturbed. Stay with me. Despite the group’s unusual name, they’re quite good. Don’t judge a book by its cover. For their album, “Immortalized,” the band chose to include a cover of “The Sound of Silence,” but they weren’t ready for the response they were going to receive. The rendition was genuinely unique, and it didn’t go unnoticed. Old fans and new fans alike were amazed by the band’s ability to transform such a classic song into something new, albeit still incredibly beautiful. 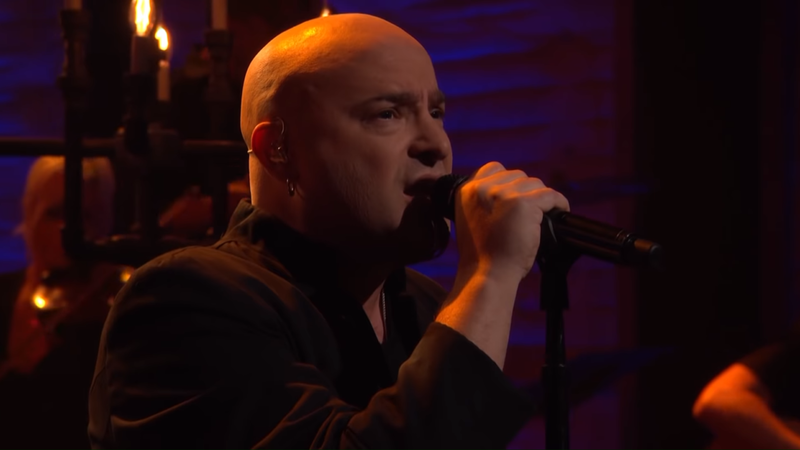 Shocked and overwhelmed, frontman David Draiman has said that the band couldn’t have hoped for a better outcome, and they appreciate Paul’s kind words. After all, without Paul, this cover would have never been possible. You have to hear this incredible rendition for yourself. You’re going to be blown away. Be sure to share the video with your friends and let us know what you thought below. Did you like this? Then share it because beautiful music was meant to be shared.